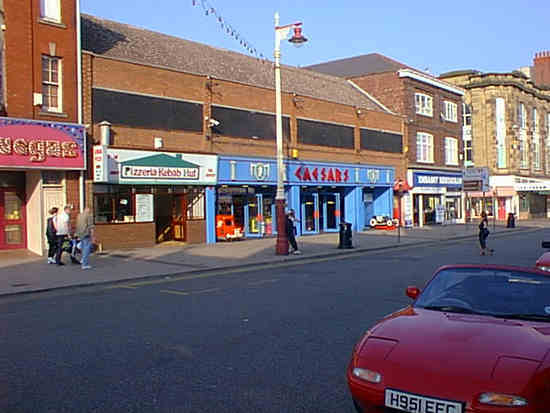 Location: Southport is on England's west coast, between Liverpool and Blackpool. From most places, head onto the M6 and take junctions 25-28. Oh dear, what a disappointment. The all-too-familiar story of pinball's decline is starkly shown at this seaside resort. This report was made on a sunny, warm, Friday evening in summer. The sort of time when a seaside resort should be at its busiest. Instead, Southport was almost a ghost town. Some of the arcades were closed, and the main business seemed to be in ice cream. At the Funtime arcade - the largest and most prominent in Southport - where there used to be at least 3 pins at any one time, today has none. The site is almost entirely given over to slot machines, with a few video games and other novelty items fringing the mass of one-armed bandits. This move to slot machines is mirrored elsewhere. The Galaxy arcade -which was closed on Friday evening - by Saturday morning had nothing else. If fact the only arcade with any pinballs was Caesars. You can see what I mean about it being a ghost town. This is the height of the summer season for crying out loud! Anyway, back to Caesars, not that you'd want to go there. They have a William's Terminator 2 and a Data East Lethal Weapon 3. Both look filthy and totally unmaintained and playing the T2 confirmed this impression. The flipper hold coils are susceptible to bouncing and the drop target sensor appears not to work. The central standups work, although they require a good solid hit and their associated lamps don't work at all. The kickback doesn't work although it's enabled and you get the dot-matrix animation. There's no software compensation either. On the plus side, this only costs 30p per game. The LW3 looked even grubbier and after the T2 it was totally resistible. So that's it. Two grubby early 90's pins and that's yer lot. 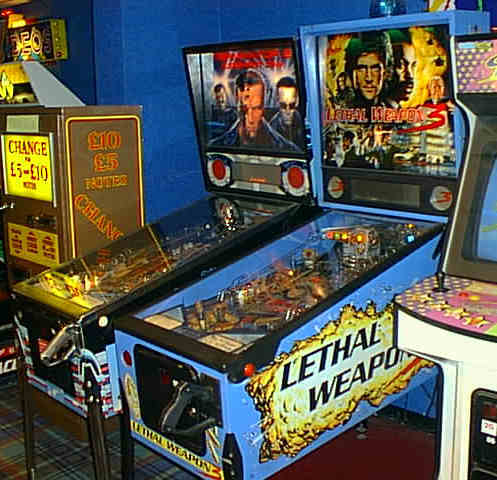 While pins have been gradually removed from town centre arcades and pubs, you used to always be able to rely on the seaside resorts for a few games, but no longer it seems. Four years later and things appear to be on the up in Southport. Andy reports that the Ceasars arcade now has a T2, T3 and a Simpsons Pinball Party all in playable condition. The Funland arcade now has four new tables in very good condition. They are The Simpsons, Pirates of the Caribbean, Family Guy and a Spider-man. Andy also tells us about the new Pleasureland fairground where he maintains 5 classic machines in top condition. They are Roadshow, Operation Thunder, Police Force, Game Show and Mousin' Around. Finally, he suggests checking out the Blundell Arms in Birkdale which always has at least one machine.